Black hole event horizon image: The work of one MIT graduate student, Dr Katie Bouman played a crucial role in creating this image as she helped write the algorithm that decoded the image. The first direct images of a black hole’s event horizon were shared by scientists part of the Event Horizon Telescope collaboration, where an international team of over 200 astronomers worked together. Eight radio observatories across four continents worked together as a giant Earth-sized telescope to help gather the data that eventually helped put together the first ever image of a black hole. However, it was the work of one MIT ( Massachusetts Institute of Technology) graduate student, Dr Katie Bouman, which played a crucial role in creating this image. 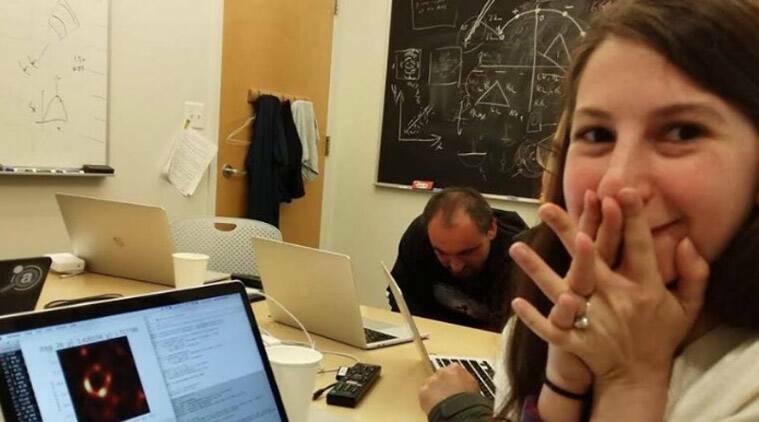 Bouman helped develop an algorithm, which decoded the data to give us the first image of the Black hole. The supermassive black hole is at the heart of M87 or a galaxy within the Virgo Galaxy cluster and is nearly 55 million light years away from the Earth, with a mass 6.5 billion times that of the Sun. According to this 2016 article from the MIT News, Bouman had explained how taking the picture of a black hole is like taking an image of a grapefruit on a moon but with a radio telescope. “To image something this small means that we would need a telescope with a 10,000-kilometer diameter, which is not practical, because the diameter of the Earth is not even 13,000 kilometers,” she was quoted as saying. Bouman’s algorithm — which she had called CHIRP for Continuous High-resolution Image Reconstruction using Patch priors is what helped patch together the data that would eventually give this image of the black hole’s event horizon. In 2017 TED Talk, Bouman has also revealed that terrabytes of data was collected and processed in the lab at MIT. The official MIT CSAIL account has also tweeted out a picture of Bouman standing with stacks of hard drives of black hole image data. What Bouman’s algorithm did was to fill in the gaps in the data collected from these eight radio telescopes. Interestingly she is not an astronomer, but has a background in computer science and electrical engineering. “It was amazing to see that first ring, but it was even more unbelievable that we all produced the ring,” Bouman told the Boston Globe in an interview, after the discover was made public. She will be joining the faculty at the California Institute of Technology this year. “Even though we had worked on this for years, I don’t think any of us expected we would get a ring that easily…We just expected a blob,” she told Time in an interview. While there’s a lot of interest on Bouman in light of the discovery being made public, it seems someone has also created a fake Twitter and Instagram profile for her.